The influence of changing conditions in the near-Earth environment on the technological systems on Earth and space is known as Space Weather. Tim A. Howard is a Senior Research Scientist at the Southwest Research Institute, Boulder, CO. He is the author of Coronal Mass Ejections published by Springer. 34 AD: The Roman Emporer Tiberius believes the port of Ostia is on fire and dispatches troops to investigate. 1724: George Graham in England and Anders Celcius in Sweden simultaneously find a deviation in their compass needle that lasts more than a day. September 1859: Telegraph systems across Europe and North America simultaneously fail. September 1941: Television and radio broadcasts are interrupted, including 15 minutes of a game between the Brooklyn Dodgers and the Pittsburg Pirates (during which time the Pirates had scored four runs). July 1979: The first US space station Skylab re-enters Earth’s atmosphere ahead of schedule, crashing into the Australian desert. March 1989: Power stations fail across Canada. January 1994: Three spacecraft Anik E1, Anik E2 and Intelsat-K fail. October 2003: Power stations across North America and two Japanese spacecraft simultaneously fail. What do these events have in common? They were all caused by the same thing. What’s more it is a perfectly natural thing that continues to occur today. They were caused by magnetic storms. A magnetic storm, the most severe type of space weather, is a large disruption to the Earth’s magnetic field (measured by Graham and Celcius) that drives currents in the atmosphere. These currents are small, but are significant if they occur in long wires (such as telegraphs and power stations) or in small electrical curcuits, such as those on spacecraft. They also disrupt electromagnetic transmissions (such as TV and radio broadcasts and satellite communications) and expand the aurora, which is what Emporer Tiberius saw above Ostia and mistook for a large fire. Finally, magnetic storms are accompanied by large amounts of energetic particles, which increase the radiation dosage for astronauts and airline passengers, and increase the density of the upper atmosphere – resulting in an increase in drag that prematurely brought down Skylab. Magnetic storms are caused when a large quantity of energetic particles are dumped into the Earth’s magnetosphere (the upper upper atmosphere, above the ionosphere). The energetic particles originate at the Sun, and arrive at the Earth either directly, such as via solar flares, or indirectly, such as via coronal mass ejections. Many of you would have heard of solar flares but few of you have probably heard of coronal mass ejections. This is a shame because in the scheme of things it is the coronal mass ejection, and not the solar flare, that is the cause of the vast majority of magnetic storms. Solar flares are easily observed as a bright flash off the solar surface and have been observed and associated with magnetic storms since the mid-19th century. Coronal mass ejections are harder to observe, have only been studied since the 1970s, and their true nature was not accepted until the 1990s. So, in terms of historical observation and public opinion, solar flares have over a 100 year head start. For the purposes of space weather, a solar flare is a large sudden release of great quantities of energy, part of which accelerates particles out into space. These particles are charged, and so are guided along magnetic field lines between the Sun and the Earth. If they happen to be on a field line that intersects the Earth, then the Earth will receive those particles. They are concentrated in number and highly energetic, so their impact with the Earth severely disrupts its magnetic field. Solar flares, however, are highly localized on the surface of the Sun, and so the chances of one erupting while on an Earth connected magnetic field line are very small. A coronal mass ejection, on the other hand, is a very large eruption from the outer atmosphere of the Sun (the corona). They are far more massive and energetic than solar flares, and their large size greatly increases the chances of one of them impacting the Earth. The are different to flares in that they have their own internal magnetic field which stores their vast concentration of particles. They can only deliver these particles to the Earth if the orientation of their magnetic field is such that it can merge with the Earth’s magnetic field (via a process known as magnetic reconnection). Because the Earth’s field always flows from (geographic) south to north it turns out that a coronal mass ejection (CME) with a southward-directed magnetic field most efficiently connects with the Earth’s field. This means that statistically half of all CMEs that are heading toward Earth will connect with its magnetic field. When this connection is established, the CME dumps large quantities of its stored energetic particles into the Earth’s magnetic field, causing the magnetic storm. CMEs also often travel quickly (taking on average only 2-3 days to get to the Earth), so their arrival increases pressure on the magnetosphere, which shrinks it. These two combined effects can cause a serious disruption to the geomagnetic field. Figure 1: A coronagraph image of a CME taken from the LASCO instrument on board SOHO. 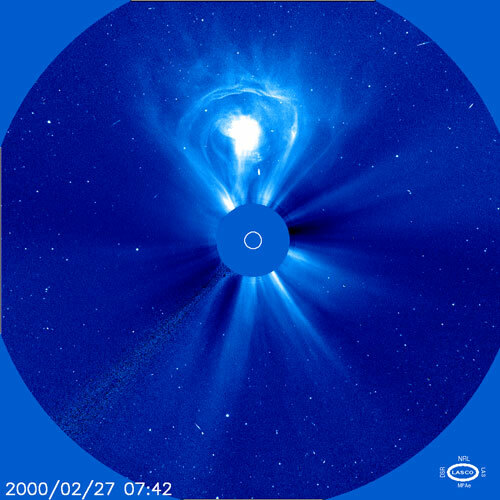 The white circle at the center represents the surface of the Sun, the blue disk is the so-called occulting disk (blocking the bright light of the Sun), and the CME is the light-bulb-looking structure heading upwards. How do we detect CMEs? When compared with the brightness of the Sun, coronal mass ejections are very faint – so faint that they can only be observed in the solar corona. This requires the blocking out of the bright solar surface, which occurs naturally during a total solar eclipse or can be achieved artificially using an instrument called a coronagraph. Even with a coronagraph it is difficult to see a CME – while some observations have been made from the ground it was not until we started flying coronagraphs on spacecraft in the 1970s that we were finally able to observe them regularly. Coronagraphs have flown on seven spacecraft missions to date, each with increasing sophistication. Currently operating coronagraphs are on board the SOHO (launched in 1995) and STEREO (2006) spacecraft. CMEs are observed as a bright loop expanding away from the Sun as shown in Figure 1. (Figure 1: LASCO/C3 image of a CME.) When they are Earth directed, CMEs appear as an expanding halo that surrounds all (or most of) the solar surface, as in Figure 2. (Figure 2: combined four images of the Halloween event.) Scientists have way of measuring their speed and mass as they leave the Sun and therefore have a good idea of how much energy they have at the start of their journey. We also have spacecraft near (but outside the magnetosphere of) the Earth that are designed to detect the solar wind and its magnetic field. So when a CME goes by it is measured directly by these spacecraft. Their properties (magnetic field, density, composition, speed) can be measured very accurately, but only for the part of the CME that happens to pass by the spacecraft. Given that they are close to the Earth or along the Sun-Earth line, we can measure the part of the magnetic field that will impact the Earth, and therefore get a good idea of whether (and for how long) its field will be pointing southward. Recall that it’s the southward magnetic field that causes the magnetic storm. 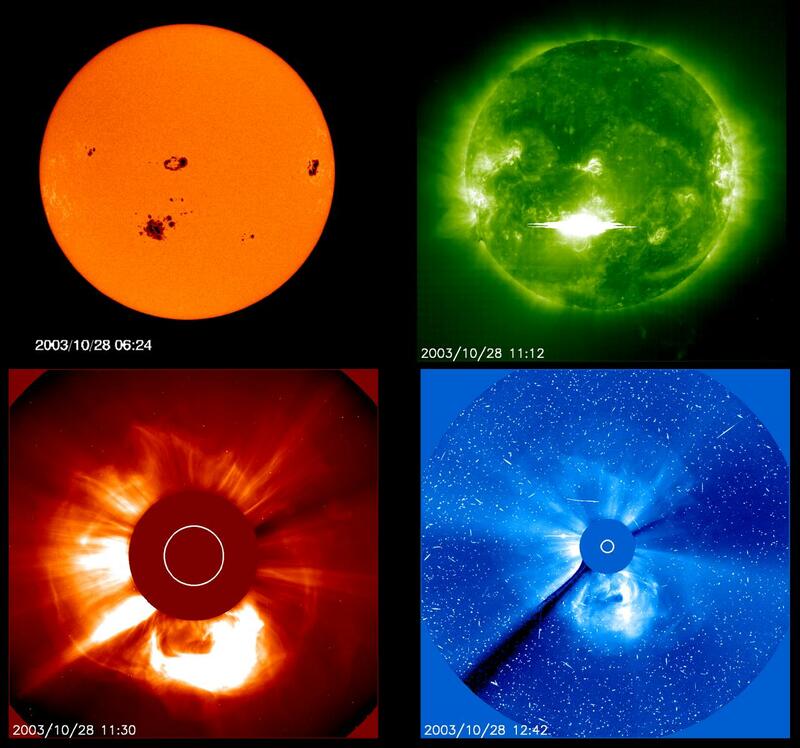 Figure 2: Images associated with the so-called “Halloween” CME in October 2003. Top left: SOHO/MDI magnetogram image; top right: SOHO/EIT image with a flare south of centre; Bottom left: SOHO/LASCO C2 coronagraph image; Bottom right: SOHO/LASCO C3 coronagraph image. The solar flare is the bright flash toward the bottom-left of the EIT image and the CME is the eruption that forms a halo around the Sun in the LASCO images. Knowing the speed of a CME near the Sun does not help us if it accelerates or decelerates on its way to the Earth. The farthest spacecraft from the Earth that can measure the Earth-directed magnetic field of a CME is only 1.5 million kilometers away from the Earth. Even for a slow CME travelling at 400 km/s this is only about an hour away. This means that we cannot predict the arrival time of a CME using coronagraph measurements alone and any detailed measurements of the CME will not arrive until it is only an hour away from hitting us. We could try and mathematically model the CME using other measurements (and many scientists already do that), but what we really need is a way to observe the CME during some (or all) of its travel from the Sun to the Earth. While no such instrument yet exists that can continuously measure the magnetic field of the CME (some ideas are currently in development), we do have one that can observe its density all the way to the Earth. These instruments are called heliospheric imagers, and they work along similar lines to a coronagraph. Just like a coronagraph, they observe the density of CMEs through scattered light in the visible part of the electromagnetic spectrum, and like coronagraphs we can use them to measure speed and mass of the CME. Their difference is that they have a much wider field of view and the ability to detect a large intensity range, so they can observe CMEs out to very large distances from the Sun – CMEs decrease rapidly with intensity with distance from the Sun (appoximately via $R^4$ where $R$ is the distance from the Sun). With heliospheric imagers we can observe CMEs throughout their entire travel from the Sun to the Earth and monitor changes to their speed and trajectory as they do so. So, by combining coronagraph and heliospheric images, such as is done with NASA’s STEREO spacecraft, we have an uninterrupted view of CMEs throughout their evolution. The ability to observe the brightness of CMEs at large distances from the Sun was first demonstrated by the Helios spacecraft, but the first complete heliospheric imager did not emerge until 2003 with the Solar Mass Ejection Imager (SMEI). It was joined by the Heliospheric Imagers (HIs) on board the STEREO spacecraft in 2006. STEREO contains two heliospheric imagers and two coronagraphs, which are designed so that they combine to observe the entire distance between the Sun and the Earth. One example of a CME observed with this combined instrument set is shown in Figure 4. (Figure 3: SECCHI images of a CME). Figure 3: Projected combined STEREO image of the CME observed in December 2008. The Sun is to the right (the Sun itself is in blue) and moving to the left we have the two coronagraphs in gold followed by the two heliospheric imagers in gray. The locations of the Earth and Venus are shown as the blue and brown spheres. The CME is the dark U-shaped structure to the right of Venus in the leftmost gray image. Helio spheric imagers are now routinely used in space weather prediction, and they have demonstrated their ability to improve these predictions in many cases. One example is for the event that is now known by scientists as “The Valentine’s Day Event”. This was an Earth directed CME that was accompanied by a bright flare and was noteworthy as it signaled the Sun’s emergence from a very quiet period of solar activity (known as a deep solar minimum). Forecasters were alerted to this event as soon as the flare was observed, and the (halo) CME was measured using the SOHO and STEREO coronagraphs. Predictions were issued, both using the coronagraph observations directly and by running mathematical models of the CME and solar wind. Every prediction had the CME arriving much earlier than it actually did. The reason? The CME ran into a dense column of solar wind material that slowed it down on its way to the Earth. The heliospheric imagers watched the CME slowing down and were able to adjust their predictions accordingly, resulting in more accurate predictions. Predicting the time and speed of arrival at the Earth. For the former, the only means we currently have is to wait for the CME to hit a spacecraft and to measure its properties directly. We could improve this by adding more spacecraft closer to the Sun, but this is extremely costly in an age of austerity. There are other means that scientists are researching to try and achieve this remotely, but that is another discussion for another time. For the latter, heliospheric imagers have greatly improved our ability to predict the time and speed of CME arrival at the Earth. They can also predict the likelihood of impact, as 3-D information is available from heliospheric imagers that is not available in coronagraphs. So with the combination of solar surface observation, coronagraphs, heliospheric imagers and direct-measuring spacecraft, we can provide a fairly complete description of the evolution of a CME. The most important thing to take away from this article is that it is the CME, and not the flare, that produces the most severe space weather (the strong magnetic storms). Hence it is vital for our continued technological development that we understand them, and can measure them in as many ways as possible. Space weather, and our understanding of it, are crucial for the future.